Tonnages: 14,651 gross, 10,051 net, 23,710 deadweight. 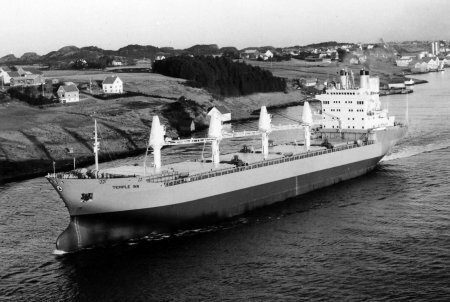 October 1972: Completed by Haugesund Mekaniske Verksted, Haugesund (Yard No. 42) for Lambert Brothers (Shipping) Ltd., London. Scottish Ship Management Ltd., Glasgow, managers. 1974:	Re-engined by Amsterdamsche Droogdok Maatschappij, Amsterdam with two Stork Werkspoor Diesel 12 TM 410 Medium Speed Engines. 12,000 bhp 15 knots. 1977:	Management to Salen UK Ship Management. 1979:	Sold Aria Shipping Co. Ltd., Greece flag, renamed. CAPE ANTIBES. Flag later changed to Panama. 1988:	Sold Shipping & Trading Associates (Private) Ltd. Denholm Ship Management UK Ltd., Glasgow, managers. U.A.E. flag, renamed PEARL OF DUBAI. Management later transferred to Shipping Management S.A.M. (V Ships). 1997: Transferred to St Vincent & Grenadines Flag. Broken up at Alang. Work commenced 4th July. Photo sent in by Jim Gray. Information by J. Drury.